Ramadan is very close. So lets make some snack today. 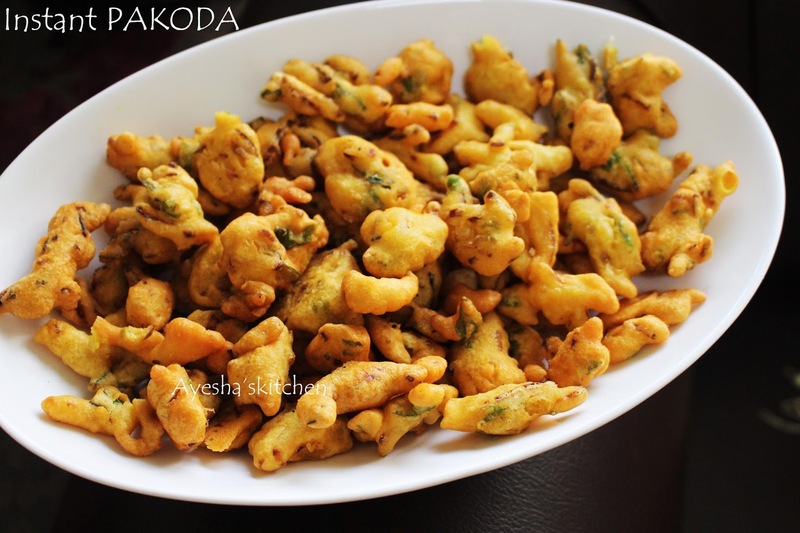 This snack is very popular in South India and can be seen in most of the tea stalls which is served as an evening snack. 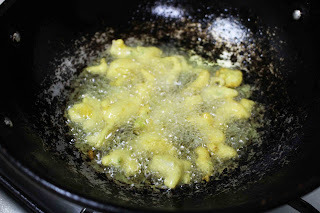 There are different varieties of bajji namely onion bajji, potato bajji, cauliflower bajji, vazhakka or raw banana bajji and like so. Banana pepper fritters, Milagai bajji, Mirchi bajji, Chillos, Peri bites, Poppers, Mulagu bajji, Chilli bajji are some of its names. I love to enjoy hot chilly bhaji with coconut chutney or tomato ketchup and savor with a nice cup of tea. When i was in Kerala, i often eat it from tea stalls. 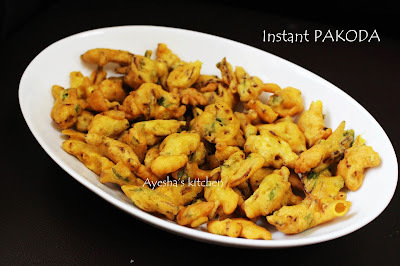 You must note some important things before making this bajji. 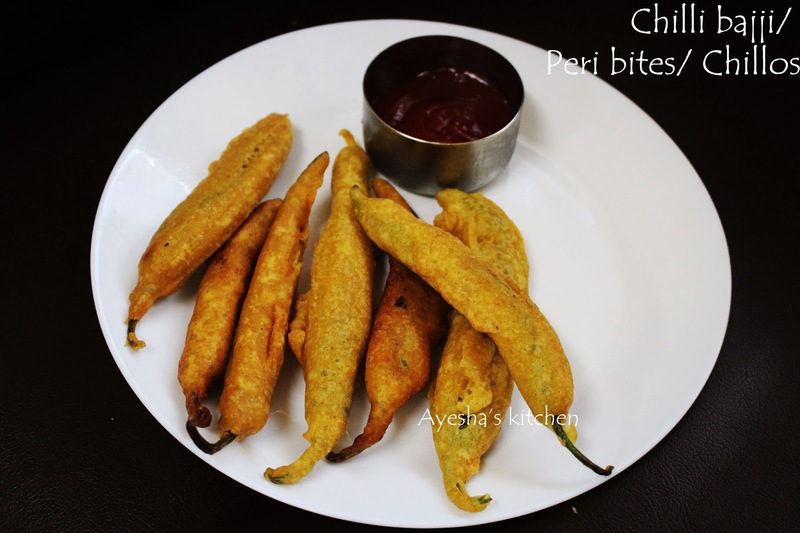 The chili used for this bajji is banana pepper or bhaji mulak or any chilli which is mildly spiced . More over you can also reduce the spiciness of bajji by deseed it and soaking it in hot salt water for few minutes. 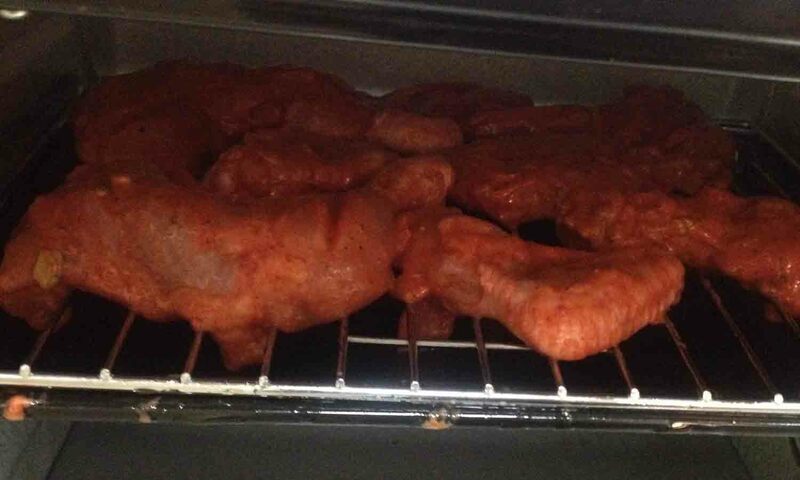 This bajji must be deep fried and the batter must be thick enough to coat on the chilly. You can also stuff this peppers with chicken fillings, veg fillings or simply mashed potato. Anyway even without any stuffing, it tastes yummy and crispy. 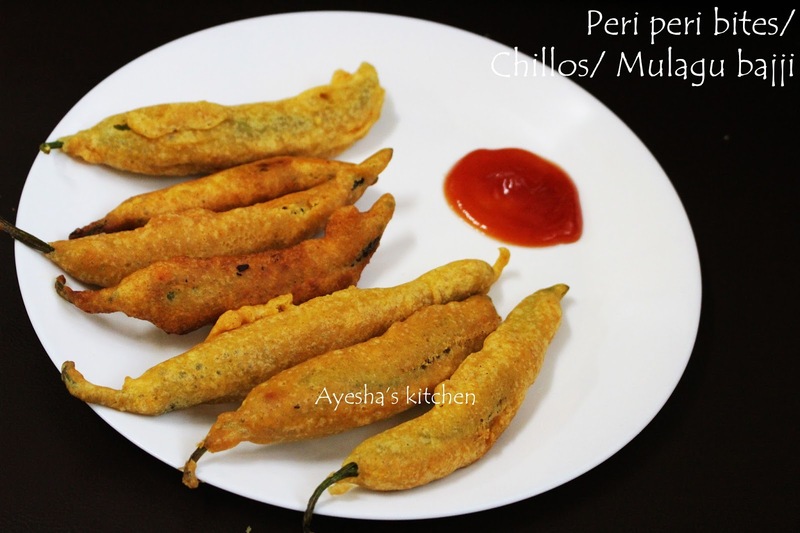 Here is the recipe showing how to make chillos / mulaku bajji / peri peri bites. Bring 2 cups of water to boil. Add salt when boiled. Remove from flame and soak the chilies in this hot water for few minutes. This is to make the chilies soft and reduce the heat of chilies. 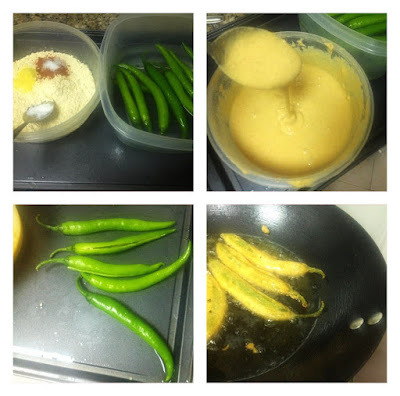 If your chilies are more heat, then dessed it and then soak. As i used mildly spiced chilies, i soaked it before deseeding. When done, slit open peppers and deseed it. Add all the ingredients except oil and peppers in a bowl. 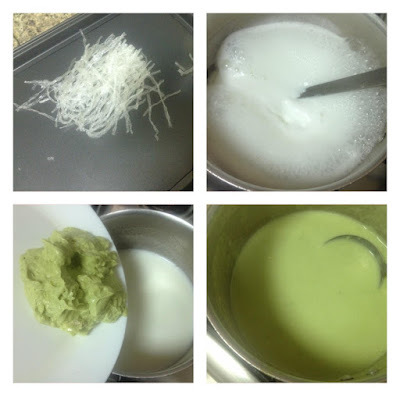 Combine it well by adding water slowly and make a thick batter. The batter must be thick to coat on the peppers. But it should not be too thick or too thin. Heat oil in a deep bottomed wok. Dip each peppers in batter one by one, filling the open and coat it well. Drop the pepper in hot oil and fry both the sides until golden. The flame must be medium low only. Papaya is a great fruit with relatively low in calories, making it a good choice for those looking to lose weight. Adding papayas to your morning smoothies is the best way to lose weight. We also use this fruit in a fruit salad for an evening snack or can make fruit salsa / papaya shake / papaya juice recipe . Any way we have got lots and lots of variety recipes with papaya fruit. 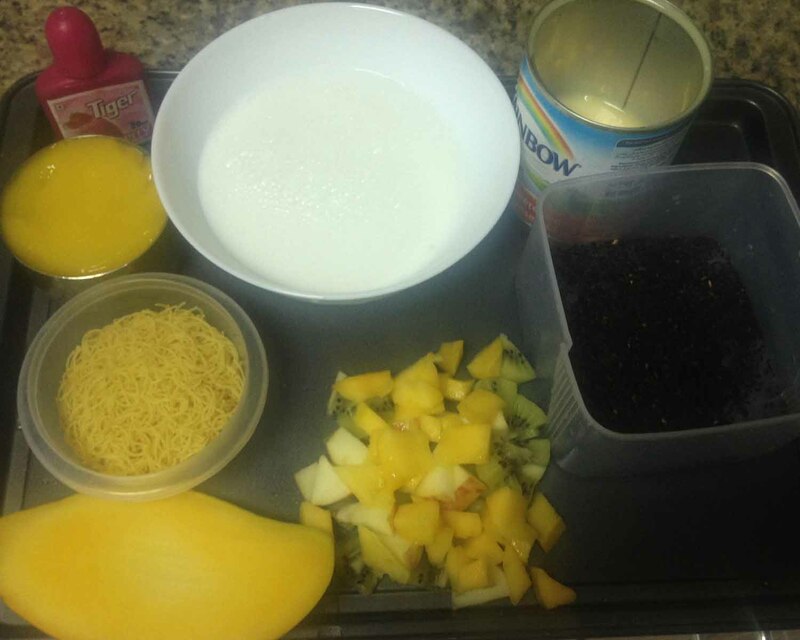 But here am gonna share the most simple and healthy recipe with papaya. Try this healthy smoothie recipes / fruit smoothie recipe. So lets learn how to make papaya smoothie recipe. Peel the skin of half a papaya and remove its seeds. And then chop it. Blend it along milk, sugar and milkmaid or a scoop of ice cream until smooth. Lets see today how to make the best oven baked Tandoori chicken at home. Tandoori Chicken or Tandoori Murgh is a spicy, juicy, soft with all flavours of spices infused. 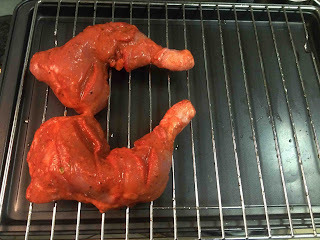 Tandoori chicken has its origin in India but, widely popular in South Asia, Malaysia, Singapore, Indonesia, Middle east and the western world. 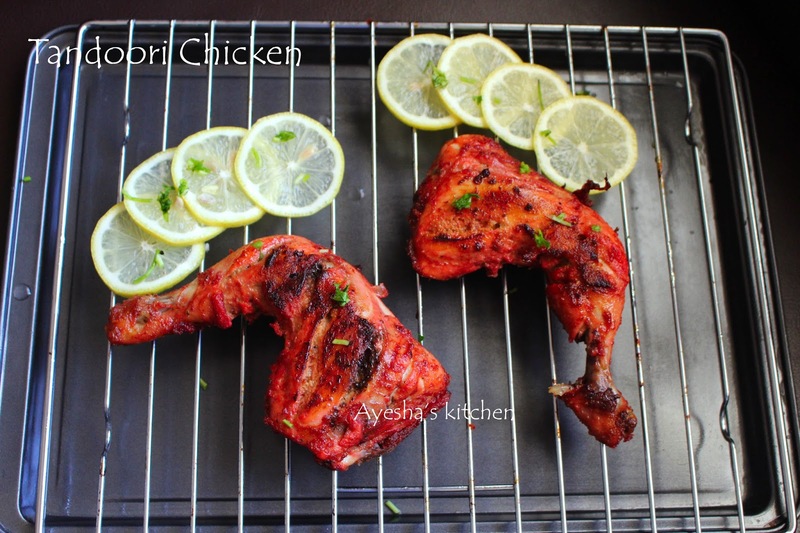 It is traditionally prepared in a clay oven called tandoor, and so this dish named as Tandoori chicken. 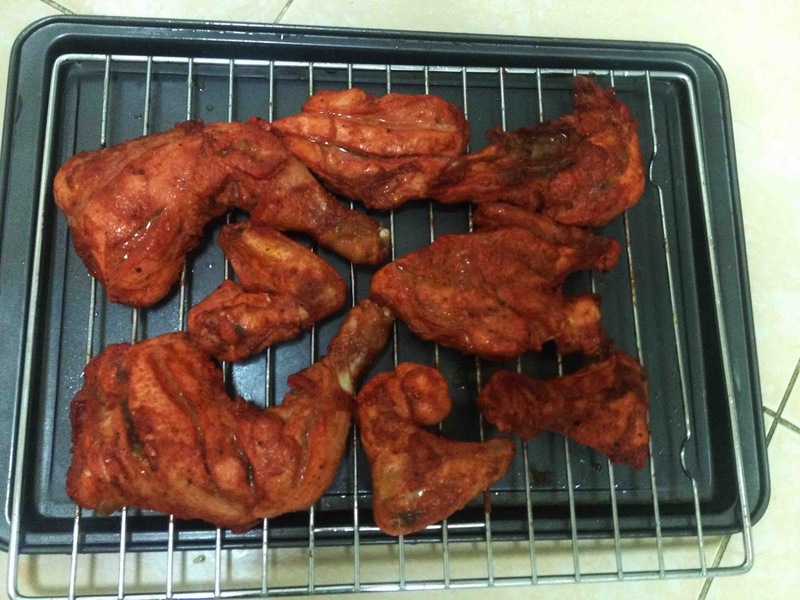 Here the chicken is marinated in yogurt and tandoori masala (special spice powder for preparing this dish which is available in market too) and cooked at high temperatures in a tandoor. For a smoky flavor, it is also heated by charcoal or wood. 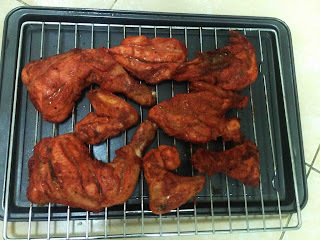 As the unavailability of such tandoor at home, we can also prepare this delicious dish in oven or grill or even on stove top, with some minor changes. 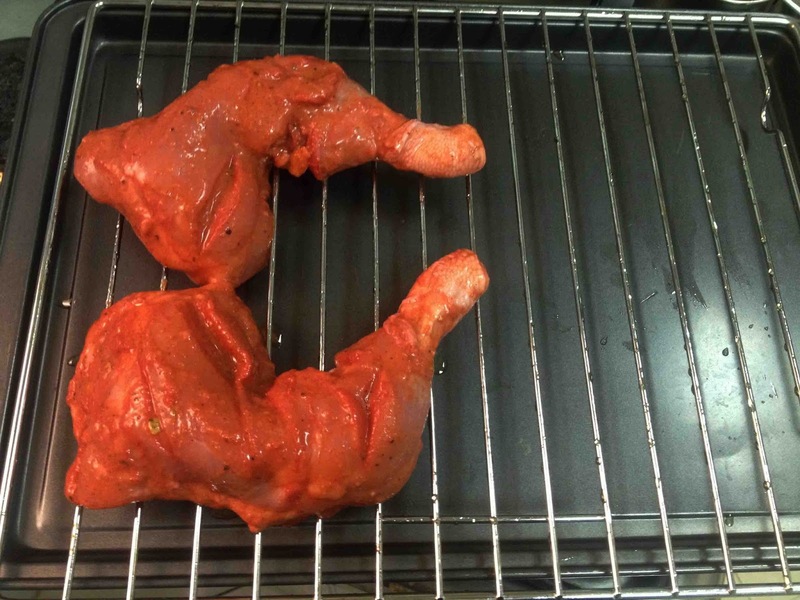 Tandoori chicken is used as a base in many chicken curries, specially in middle eastern restaurants, they used this chicken in butter chicken. The fame tandoori chicken led to many derivatives such as chicken tikka (Indian dish popularised in Britain) commonly found in menus in Indian restaurants all over the world. 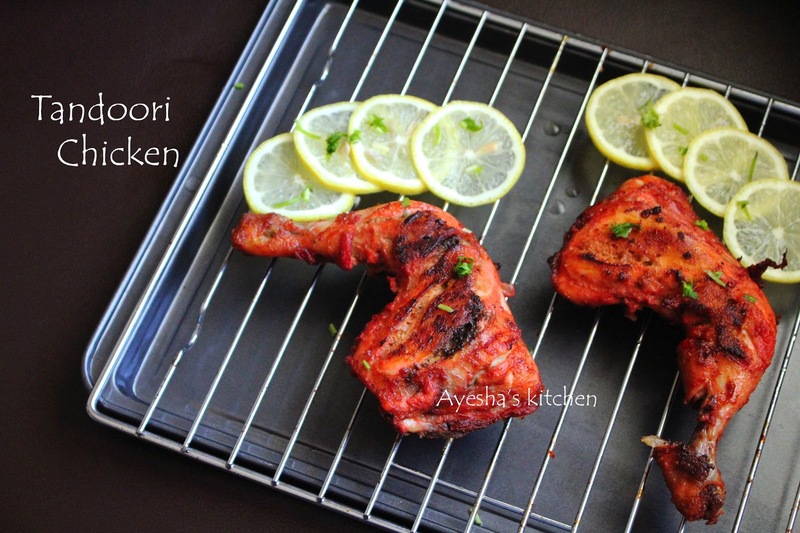 Try out this perfect no fail recipe showing how to make tandoori chicken at home in an oven with step by step pics. Recipe courtesy ..VAHCHEF. Red food color - few drops (optional),( my coloring tip -- grated pureed beetroot cooked with little water for few minutes and then added few drops in my marinade )really it turns out great and healthy too. 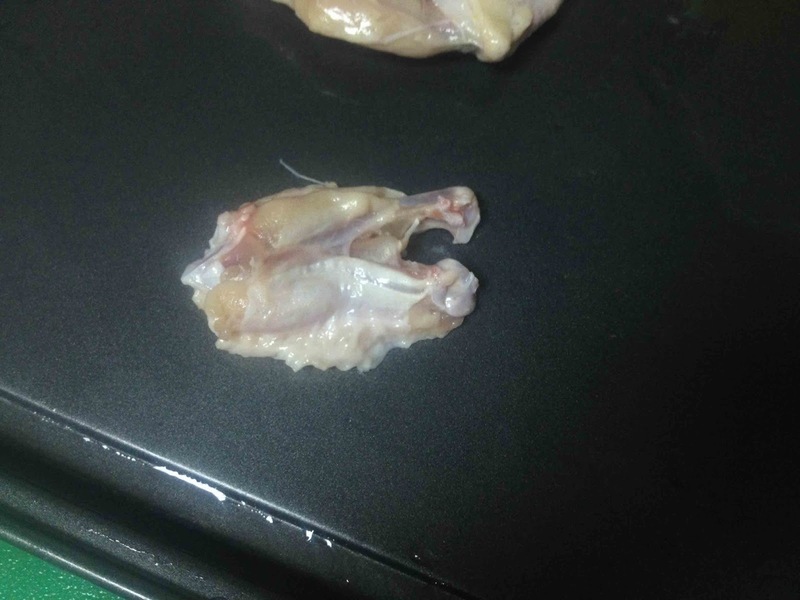 Clean the chicken pieces well and pat dry. Make slits on each pieces. 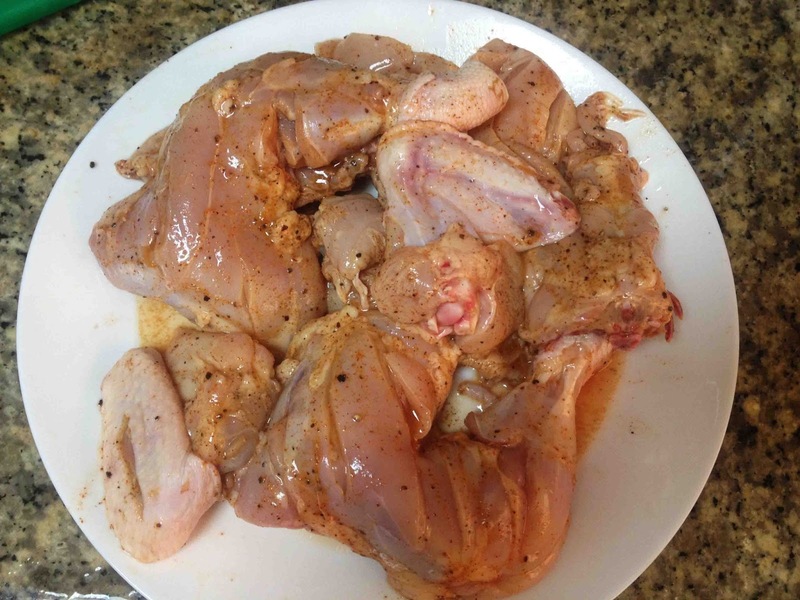 Apply salt, lemon juice and chilly powder all over the chicken and inside each slits. And keep in freezer for 10 - 15 minutes or can set aside also. 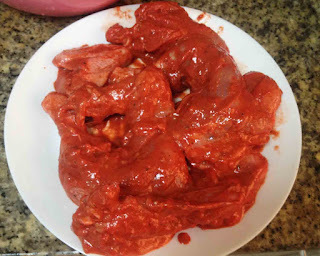 Meanwhile make a thick smooth paste with all other ingredients (can blend in a grinder) except oil and marinate the chicken pieces with this marinade. Make sure to apply in between all slits. Finally apply oil and mix well. Let it refrigerated for 2 hours or at least half an hour. Preheat oven to 200 degree C (it depends on the oven used). 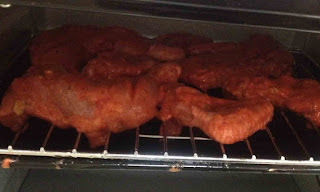 Place the chicken pieces on the grill (apply some oil on the grill) and keep a baking tray below the grill so that the gravy or the water from chicken will be stored in that tray only. Cook for 20 minutes or until the chicken becomes tender and golden. Now flip the chicken and spread some oil on the top. Again cook for another 20 minutes or until it get cooked well. Remove from oven and serve as such or for a smoky flavor u can heat up a pan with 1 tsp oil or butter and toss this baked chicken on a high flame both the sides. This makes the chicken looks yummy and perfect same like restaurant style. Serve along with lime wedges or slices and garlic paste. 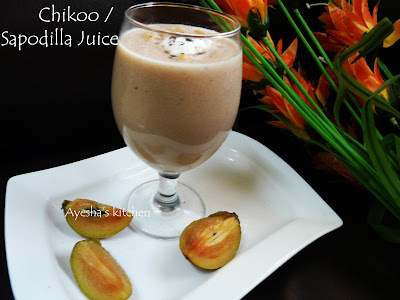 Let's have some refreshing Indian drink or dessert today. Falooda is very popular among most of the Indians and has a special place among Desserts in restaurant menu card. Though I love to have some sweets after my meal, the names like royal falooda, rose falooda, Phirni falooda compels me to order one. 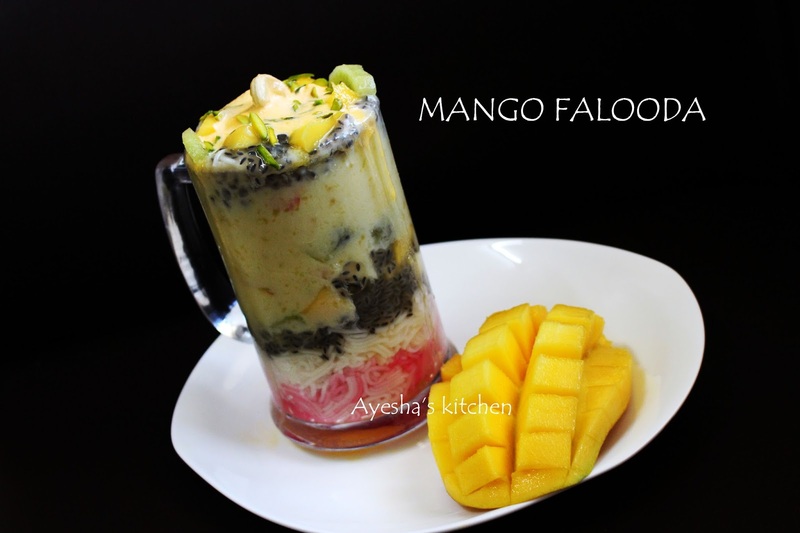 So let's learn the recipe of mango falooda today. 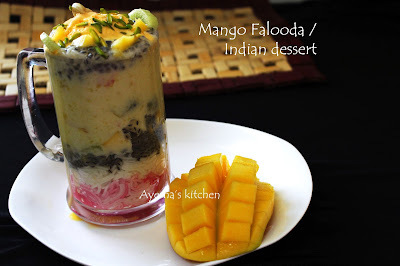 Mango Falooda is the perfect summer dessert with mango and the basic falooda ingredients like rose syrup, falooda seev, vermicelli and sabja / basil seed and ice cream. It is equally popular in India as well as countries around the world. The origin of faluda is basically from Persia, and this dessert came to India along with the Muslim merchants that settled in India from Persia. It is very similar to the Thai drink Manglak. Let's come to the recipe. 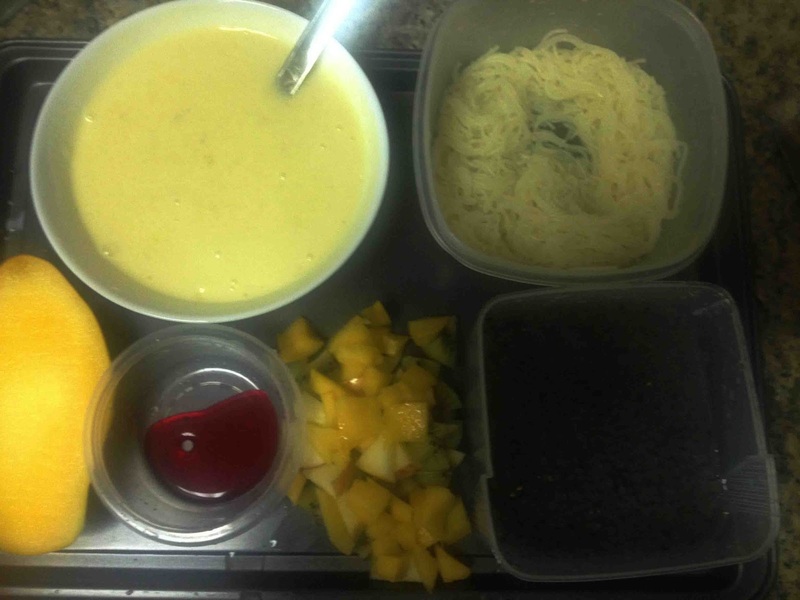 All u need for mango falooda is some mango puree, chopped mangoes and some other fruits, rose syrup (which gives a fine fragrance and flavor), mango ice cream or normal ice cream, sabja seed, milk, milkmaid, and falooda sev or vermicelli. Here is the recipe showing how to make yummy delicious Mango falooda. Firstly set everything ready. 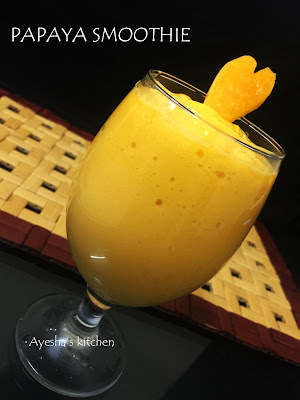 So chop the mango (1 mango)and blend it well without adding water and sugar. So puree ready. Now blend chilled milk and sugar (as per sweet). 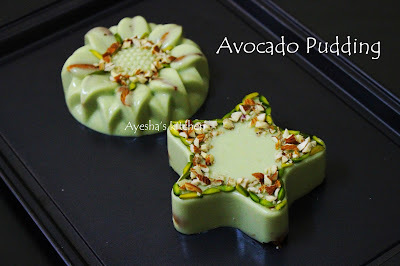 When done add the milkmaid and mango puree to it and mix well. The consistency must be same like that of a smoothie. 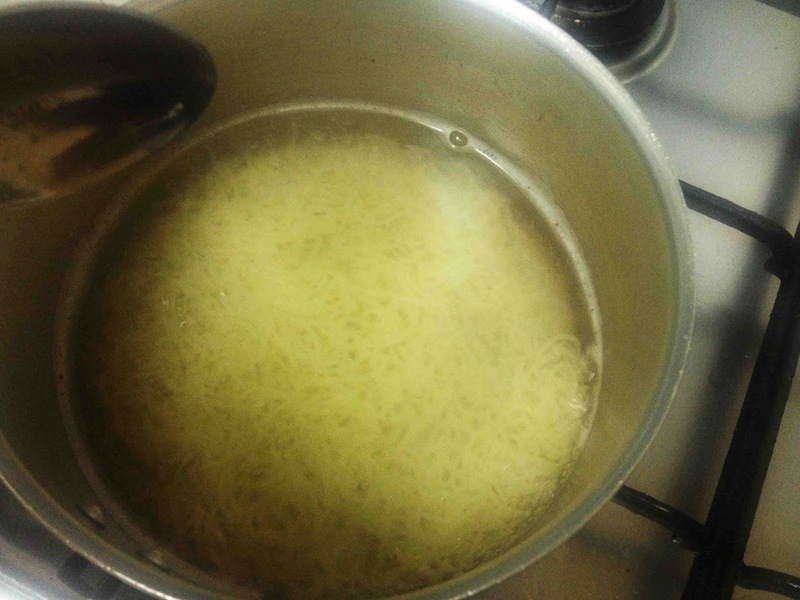 Then prepare the falooda sev or vermicelli by boiling them in water until they are cooked. Rinse them in tap water and drain using a strainer. Let it cool to room temperature. 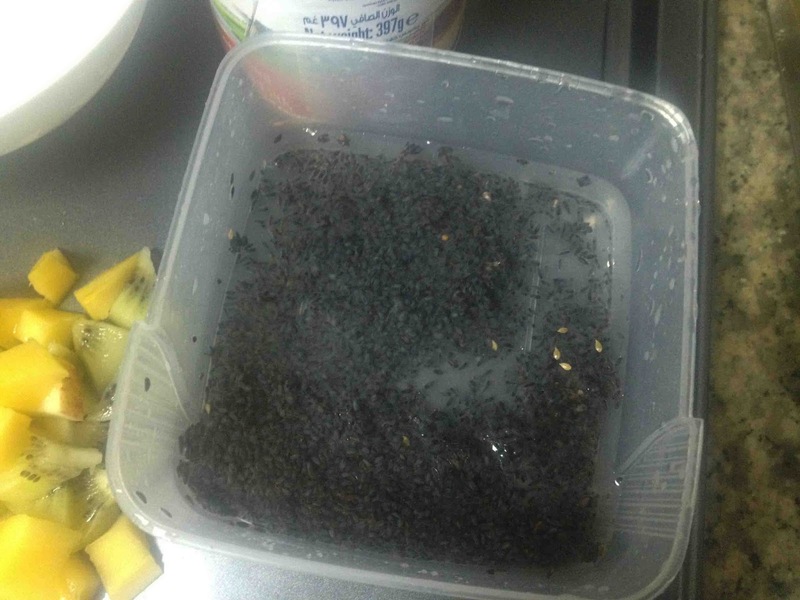 Soak the subja or basil seed in water for 10 minutes or less. Later strain them with a strainer. Set aside. Add few drops (3 drops) of rose syrup in a bowl and mix it with 1 tbsp of water. Set aside. Now the assembling of falooda. In a serving glass, add few drops of prepared rose syrup. Then add 1 tbsp of falooda sev or vermicelli cooked. Then add 1 tbsp of soaked subja seed/basil seed. Now add some chopped fruits. Now pour the prepared mango milk mixture. And finally top it with a scoop of ice cream, chopped mangoes and some nuts for garnishing. Today let me share an Indian Chinese cuisine which is a very popular starter recipe. Chicken lollipop, a hot and spicy appetizer made of chicken wings. 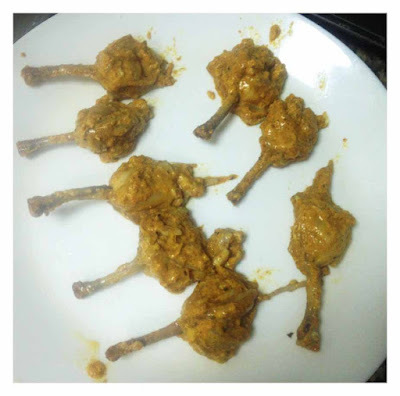 A platter of chicken lollipop with spicy szhechwan sauce or garlic paste is quite enough to make kids party great. It is loved by kids of all ages. Not only kids, me too love having this spicy juicy lollipop while watching tv or as an evening snack. 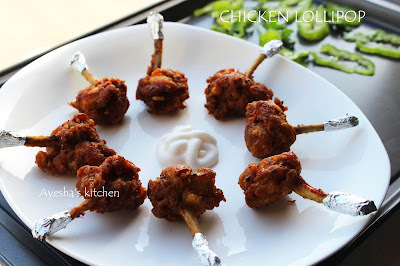 My kids always need chicken in various shapes and names like the chicken lollipop, chicken popcorn, nuggets, tikka, chicken balls like so. They dislike eating chicken from gravies or curries or even from any Chinese dishes like chicken chili, garlic chicken, ginger chicken and like so. Chicken wings/buffalo chicken wings are very popular in America(US) as a top bar food. They are usually deep fried and then doused in some hot sauce in the same shape. 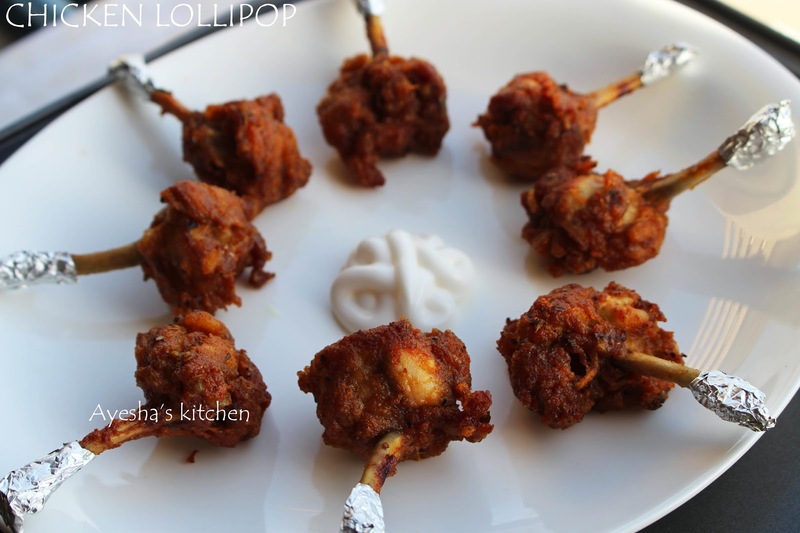 I used to buy store bought lollipops for making the chicken lollipop. But I too decided to make my own lollipop with chicken wings. And this makes me more satisfying than store-bought lollipops. 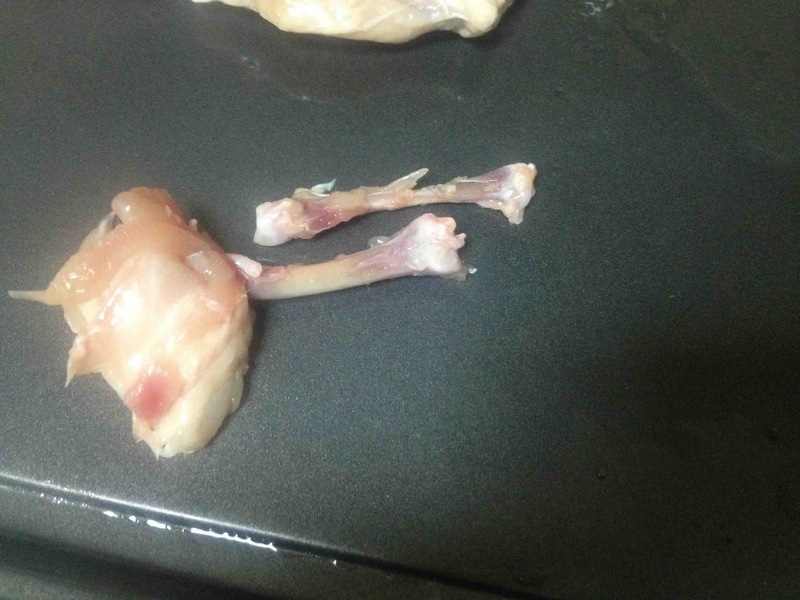 Chicken wings have 2 parts "drumette and wingette''. 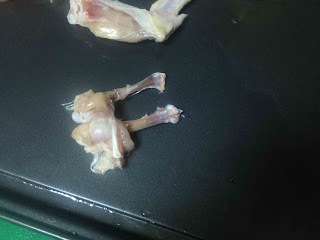 I am here using wingette to make the chicken lollipop. Do try this way and make homemade lollipops for your kids and family. 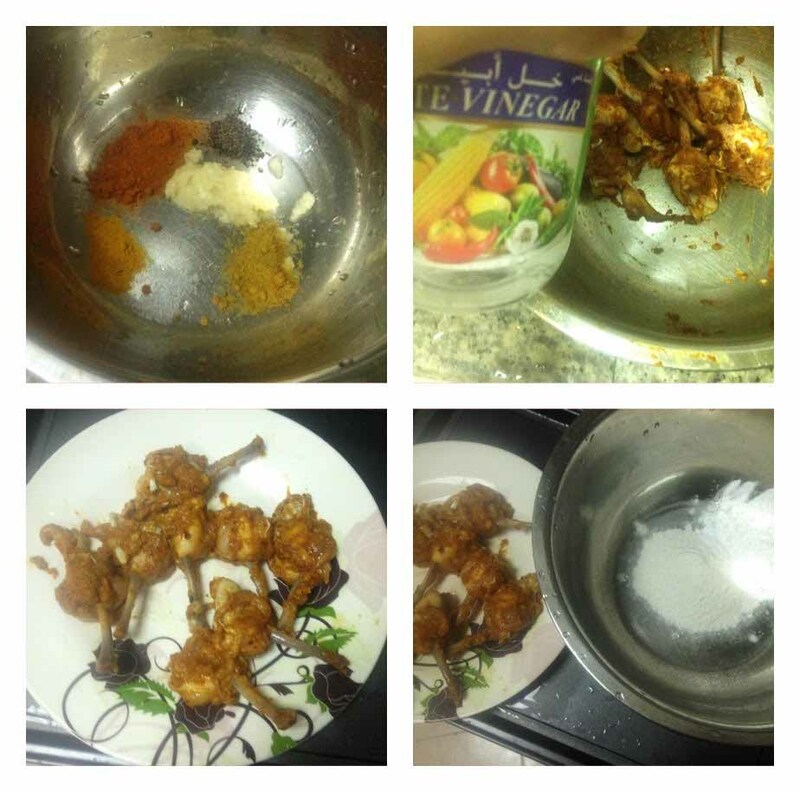 So let's see how to make chicken lollipop from chicken wings. Enjoy cooking. Take the wingette part as shown in the first image. Cut off the end part using a sharp knife. Now u can see two bones just run the knife and separate the bones. 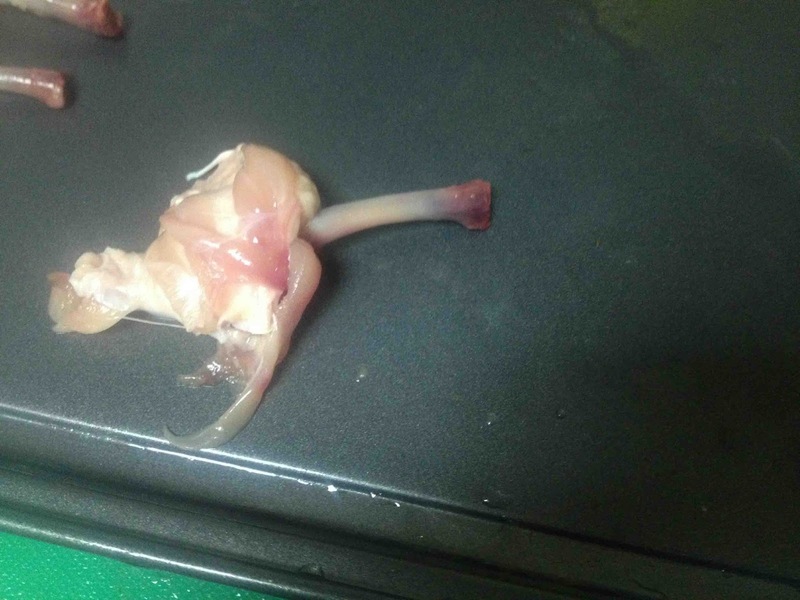 Slowly remove the thinner smaller bone by twisting it slowly. Do check these images given below for more. So lollipop ready. 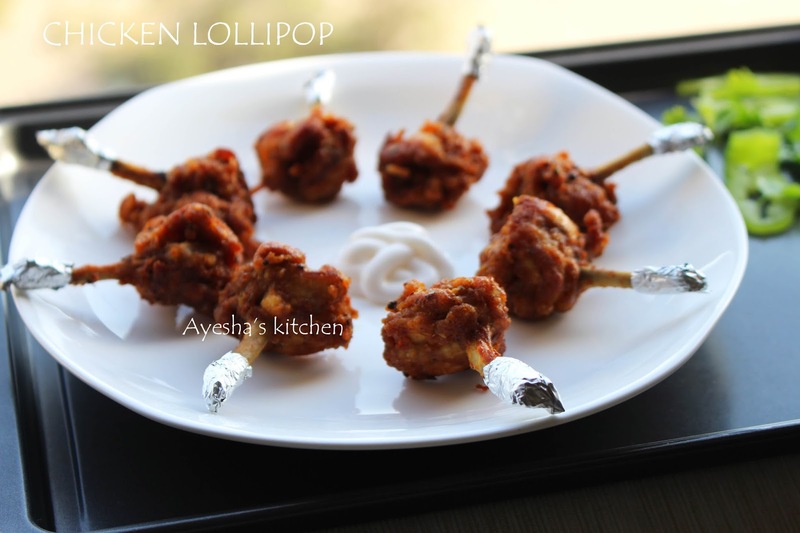 Don't worry, am sure you will become an expert, once you make your own lollipops from wings. Marinate the cleaned chicken lollipops with the marinating ingredients except for all-purpose flour and cornflour. 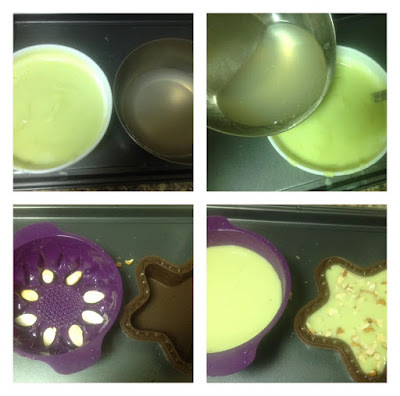 Refrigerate for 15 minutes. Now mix together all purpose flour(maida) and cornflour in a bowl. Coat the marinated lollipops with this flour well. Heat oil in a kadai or wok. 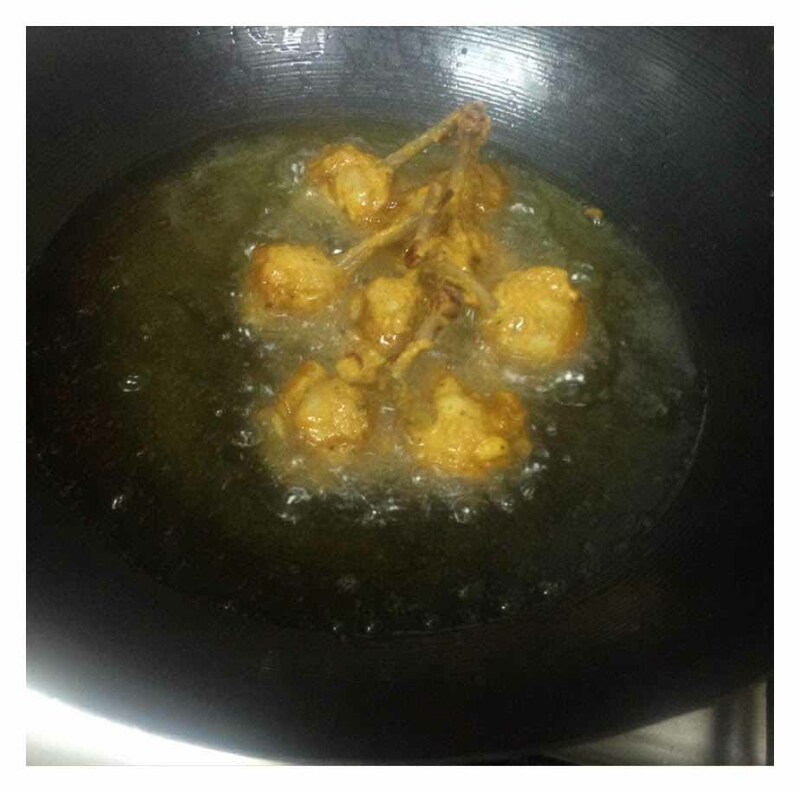 Once hot, drop the chicken into hot oil and deep fry it until golden and crispy on a medium flame. Tornado potato fries!!!! 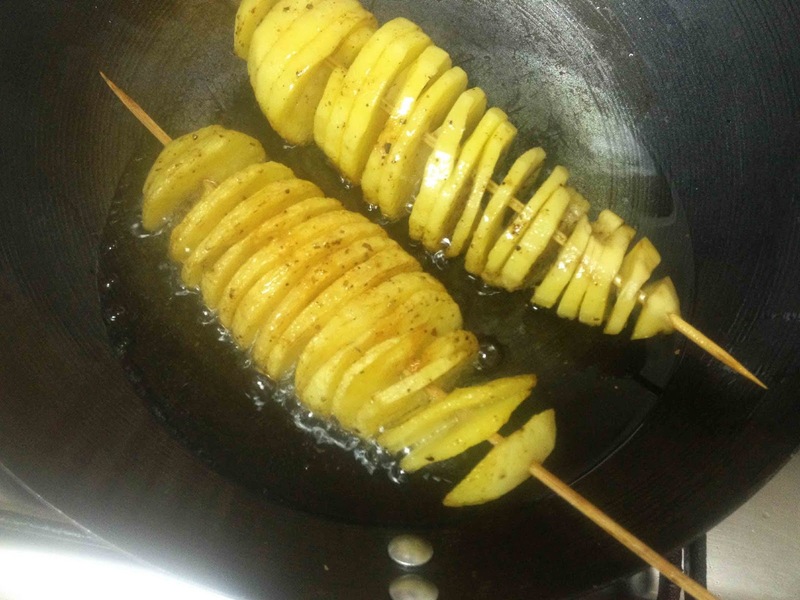 Did u seen those spiral cut potatoes that are skewered, deep fried and displayed in malls or shopping centers? 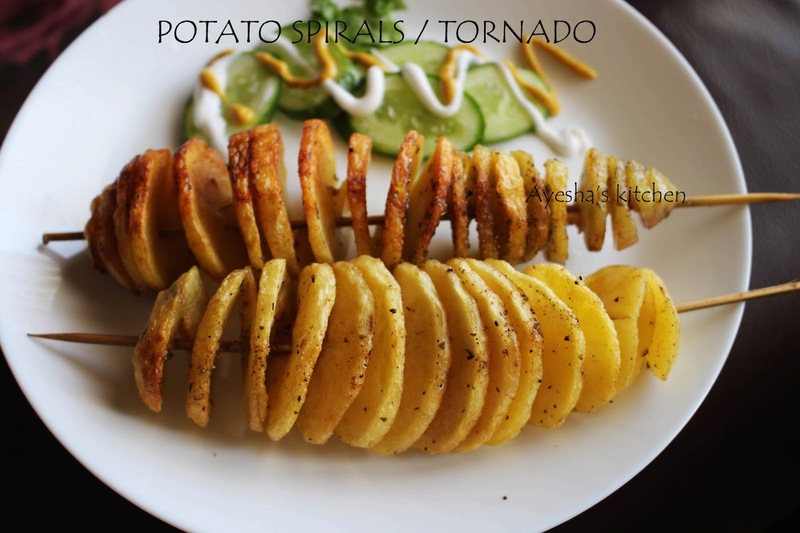 Those potato spirals are named as Tornado fries. Its the street food treat found in SEOUL - South Korea. It is also a very common and popular street food treat in UK, US, UAE etc..When your craving for potato chips, try this spiral potato recipe at home instead of store-bought chips. I always wonder how these potatoes are beautifully skewered in spirals. Thought it might be of continuous experience. No, it is not. 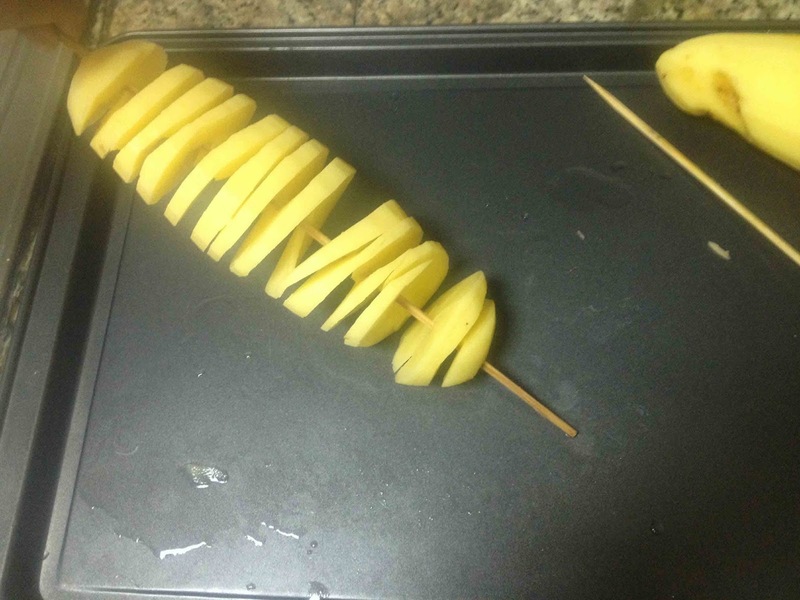 The potatoes are cut with a custom spiral cutter/potato slicer machine which gives the perfect spiral shape. As i did not have one at home, I resorted to the manual way of cutting using a thin sharp knife. Ha ha..its soo simple. Even I made it on my first attempt though the spirals weren't so thin. But it tastes yummy and lovely with soft and crispy texture. Here I used big potatoes instead of small. Actually, small potatoes are better for making spirals than the large ones. And you bake it instead of deep frying. Hope the baked recipe is healthier than the deep fried and will share the recipe soon. 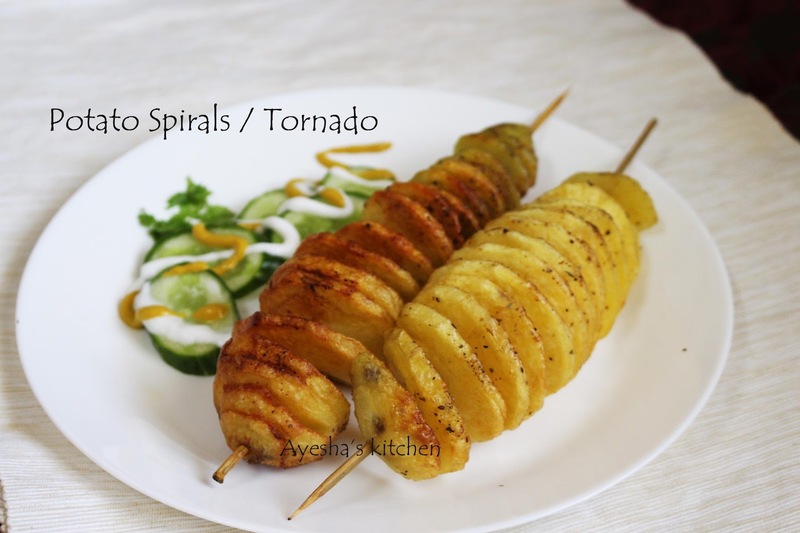 Here is the recipe showing how to make potato spirals or tornado fries at home. For making a crispier potato spirals, peel the potato and dip it in ice cold water for 15 minutes. 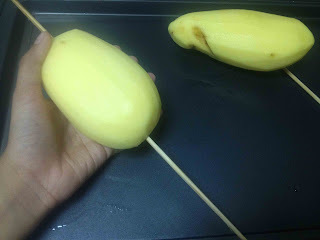 Then pat dry and apply little oil all over the potato and keep it refrigerated for another 15 minutes for the best result. If you skip this, don't worry. This only for the perfect texture. 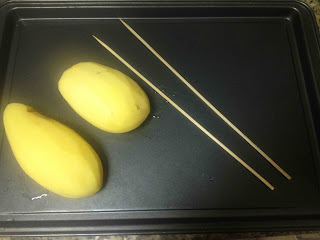 Now place greased whole potato (small potatoes are easy to handle) on a tray and insert a skewer into the potato from one end. Gently push the skewer all the way through it. 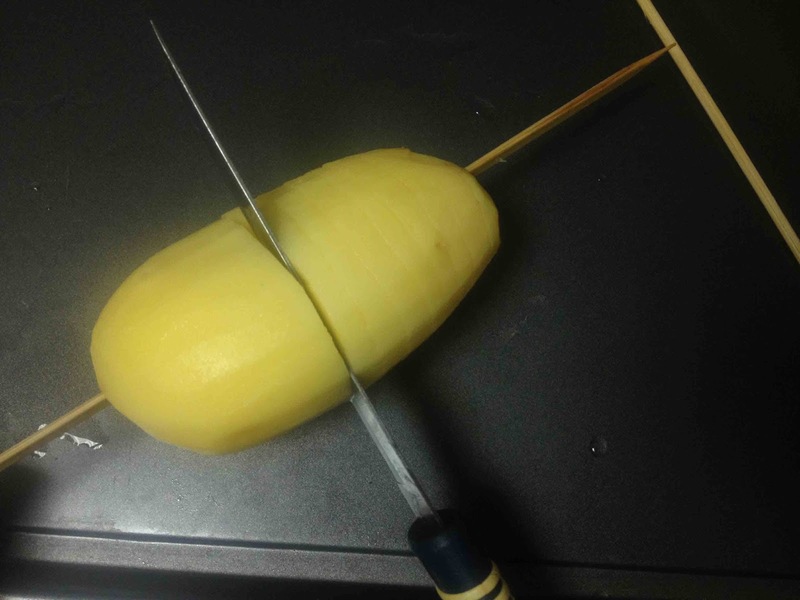 Hold a sharp thin knife and cut the potato in the opposite direction you are turning the potato. 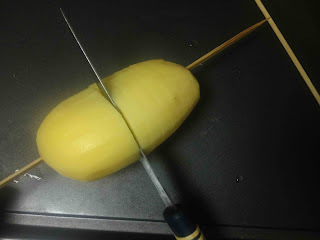 That means to cut with a knife from one end slightly at an angle and then rotate the potato until the knife reaches the other end, cutting continuously. 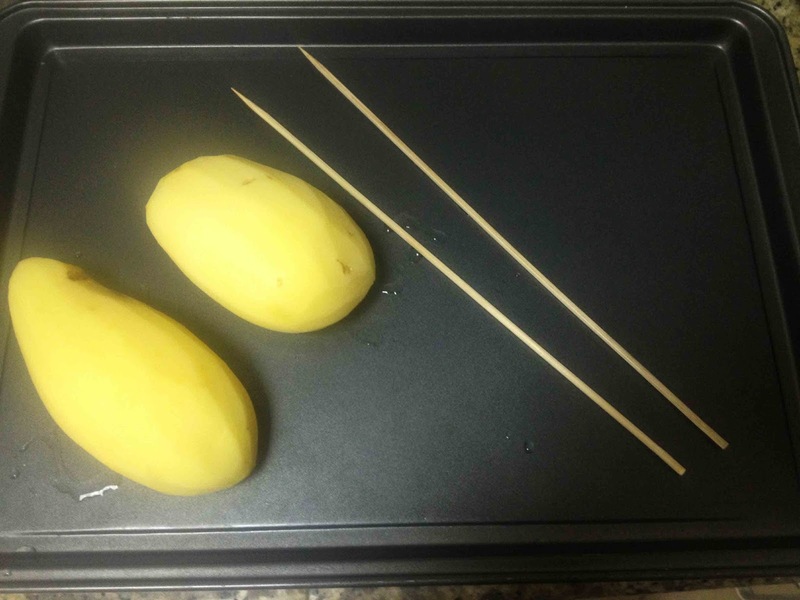 Gently pull out the potato until you have an even gap in between the slices. I just make small gaps as my potatoes are big enough. So try to use small potatoes. 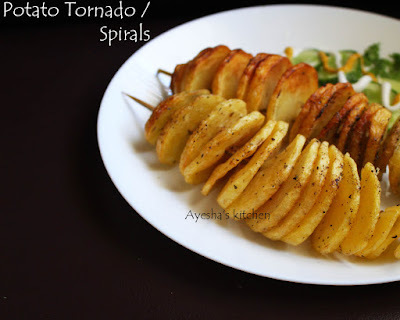 Season the potatoes by mixing the spices together and then sprinkling over the spirals. Finally deep fry it. Serve immediately. Please subscribe to my YOU TUBE CHANNEL - Click here for more cooking videos. 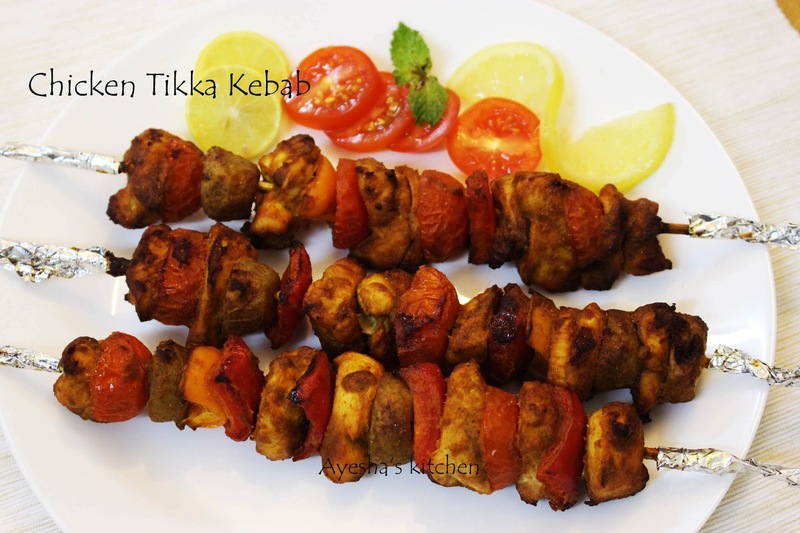 Chicken tikka kebab is one of the most popular starter recipes in India. 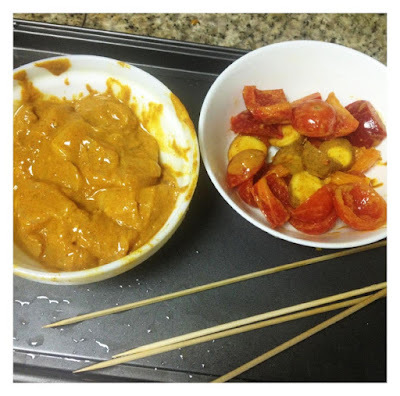 So today let's see how to make chicken tikka kababs in the oven or on a grill. Tikka means bits, pieces or chunks. 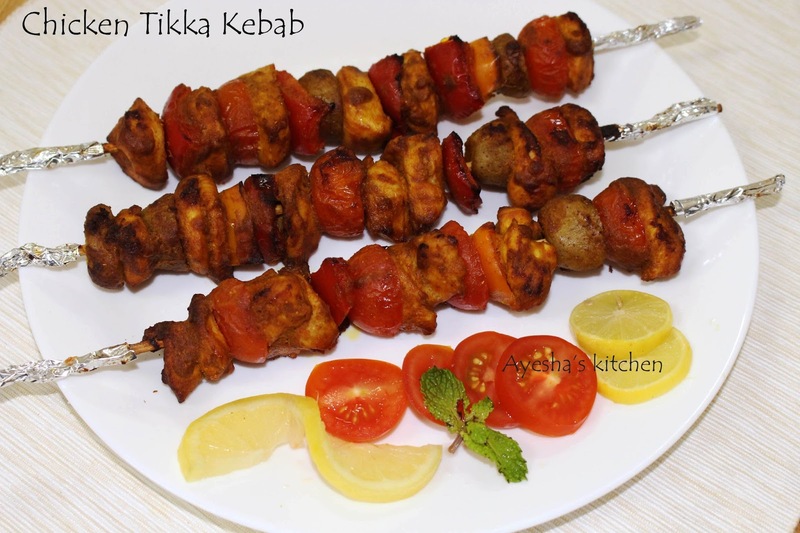 Chicken tikka kebab is traditionally small pieces of boneless chicken marinated with curd/yogurt and fresh spices and then baked using skewers in a clay based oven called Tandoor. This is normally served as a non-veg starter like a chicken lollipop. 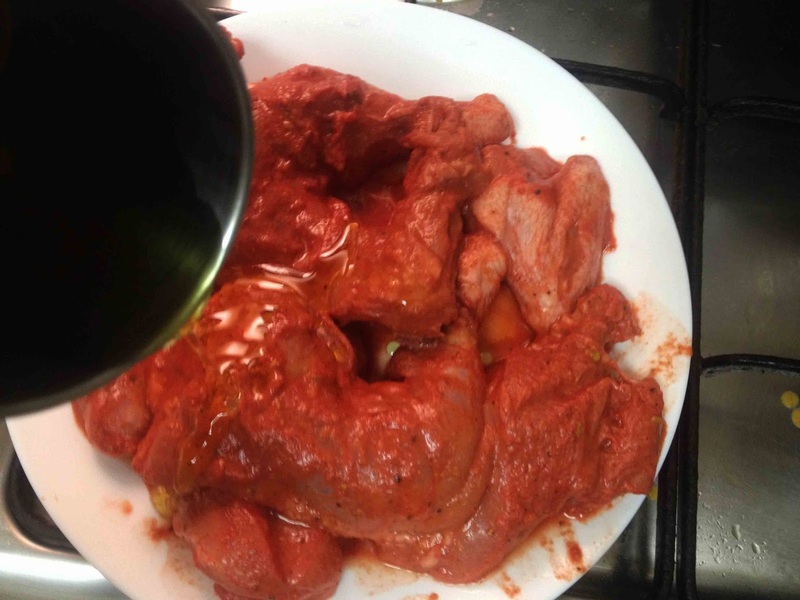 Or can also used as a main course as chicken tikka masala gravy. Paneer tikka kebab is another such delicious veg starter which is prepared the same way. Kebab (American kabob) is a word originated in the middle east which is a common dish consisting of the skewer with small pieces of meat or seafood together with vegetables like baby potatoes, tomatoes, bell peppers etc. 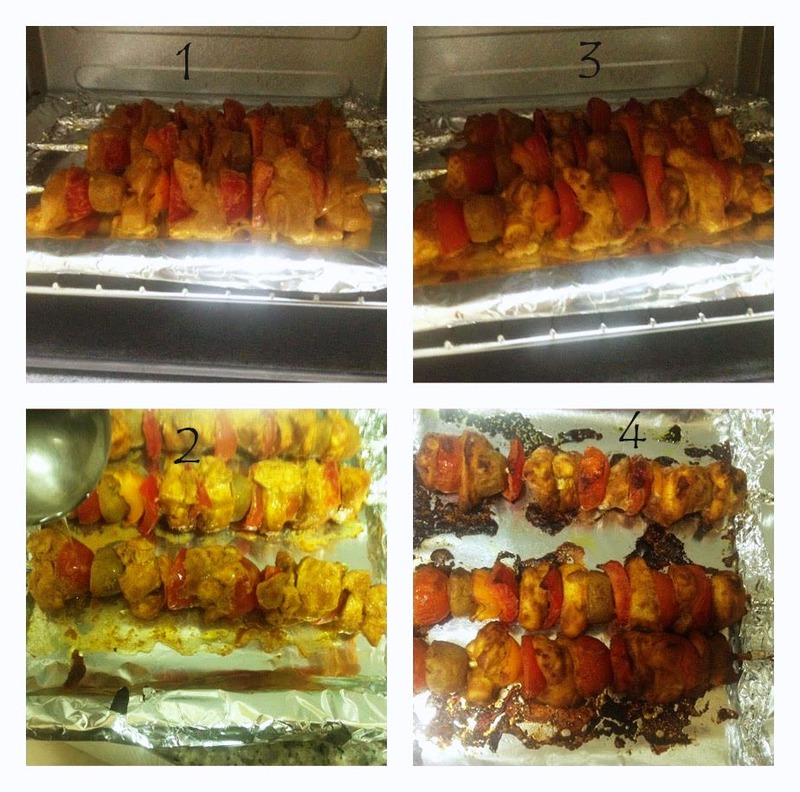 It is also known as Shish kebab (Turkish word)or Shashlik. 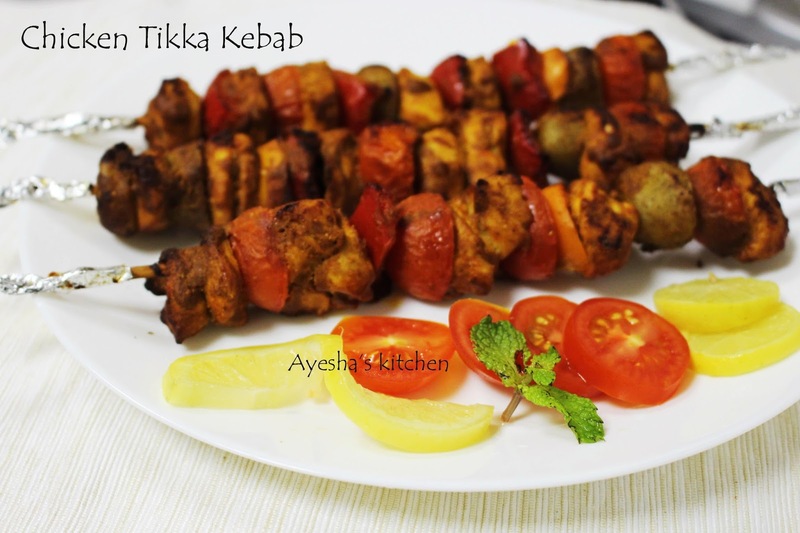 Kebabs are cooked at home and restaurant on a grill or barbeque (bbq). 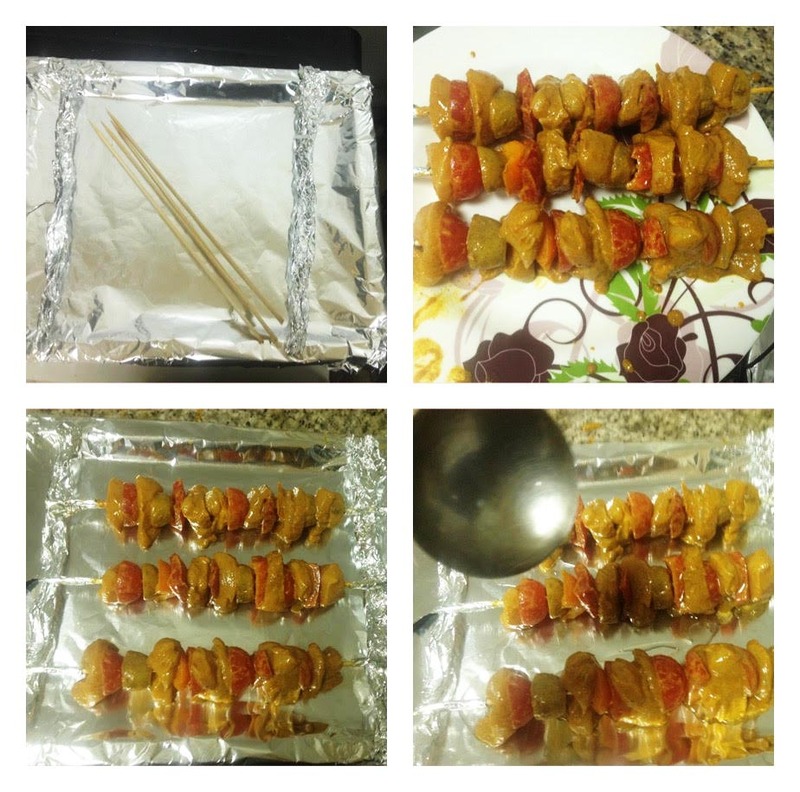 This term also used to describe any similar looking skewered food such as brochette, satay, souvlaki, etc.. Here is the recipe for Chicken tikka kebab. So do try and enjoy this delicious chicken tikka kebab. 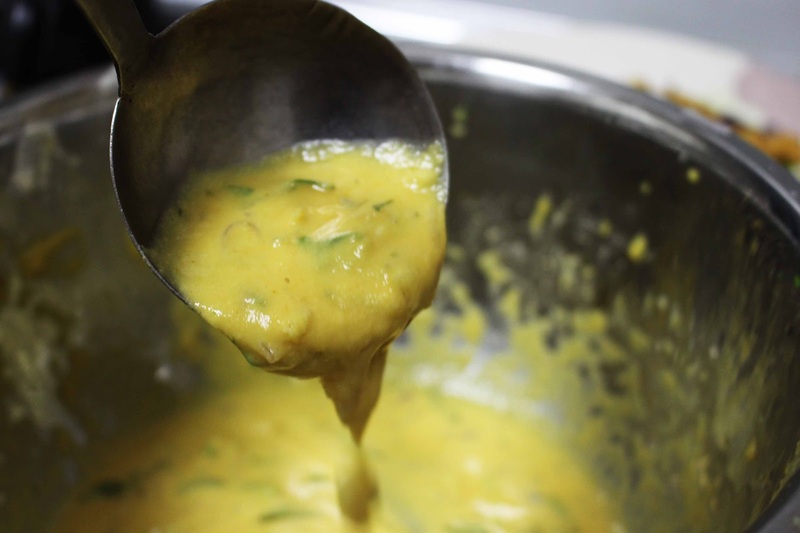 Mix together curd, ginger-garlic paste, garam masala powder, coriander powder, red chili powder, Kasuri methi, lime juice and salt in a bowl. Add red food color now if required only. I skipped it. Now give a fine mix. 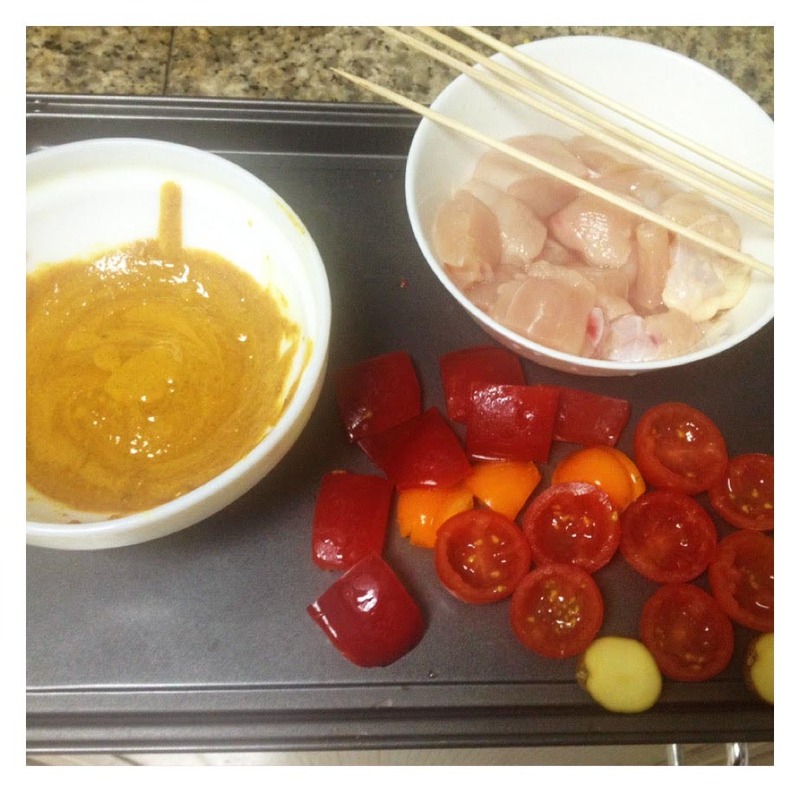 Then marinate the chicken cubes with this marinade. Add the veggies too to this marinade. 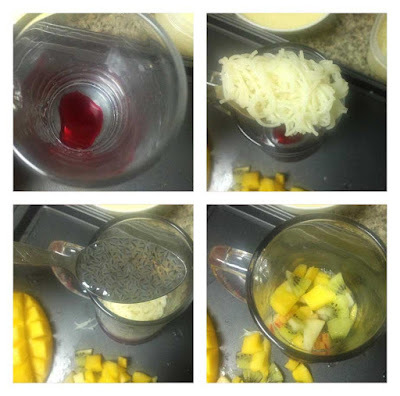 Mix it very well and set aside for 30 minutes. After 30 minutes, put the marinated chicken and veggies into the bamboo skewers. Take a skewer, put one piece chicken followed by bell pepper cherry tomato and baby potato. 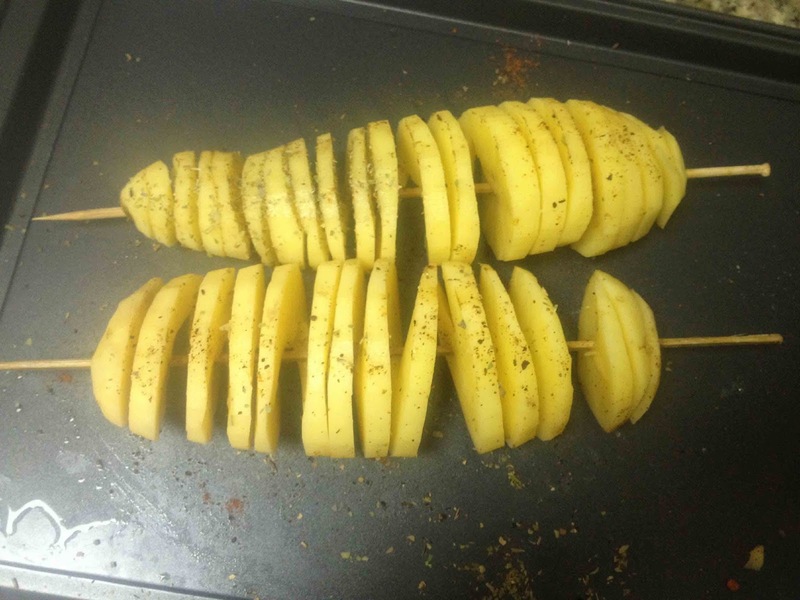 Repeat the same until one skewer is completely done. Now take a baking tray lined with silver foil. Grease the foil with oil. 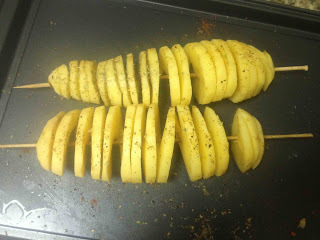 Now keep the skewers on the baking tray. 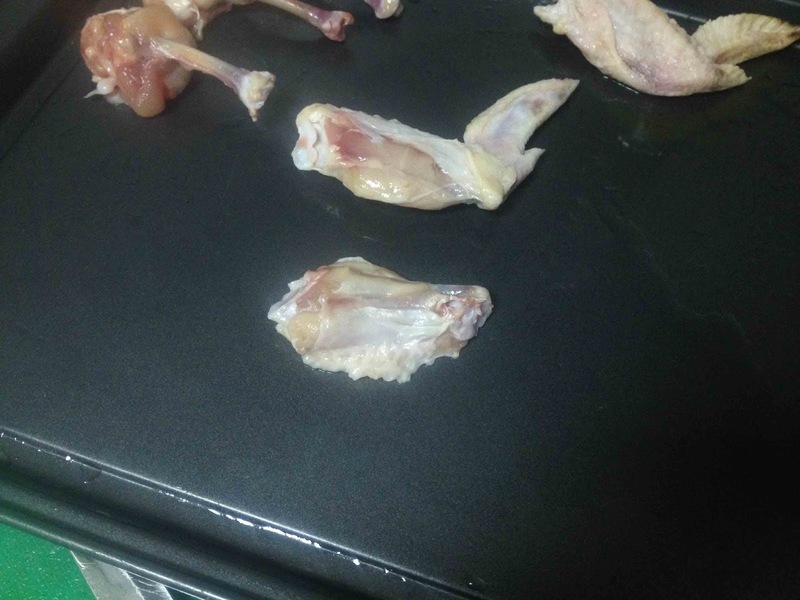 Apply some oil on the top of the chicken. Keep the chicken skewers in the pre heated oven (preheat for 5 minutes) and bake for 15 minutes (at 200 degree C). Take out carefully and flip the other side. Apply some oil on the top. Again bake for another 15 minutes. It will take around 30 - 40 minutes for the perfect texture, time depends on the oven used. So bake until chicken is done. Garnish with lime wedges and cherry tomatoes. Serve hot.